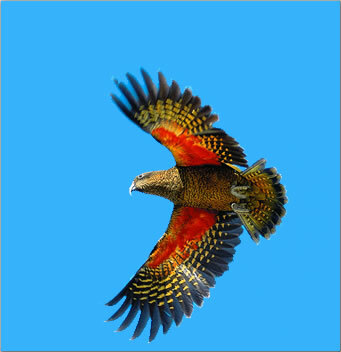 The Kea is the second native New Zealand bird pattern that I have completed from Juliet @ Tartan Kiwi. Along with each pattern, I want to introduce you to the wonderful bird’s she has based her patterns on. So the kea…. …Is a mischievous kea, is the world’s only alpine parrot and can be found in the forest and alpine areas of the West coast of the South Island in New Zealand. It is considered an endangered species. If you are sight-seeing around Milford track/tunnel, you are definitely likely to see the naturally curious and intelligent Kea; an olive green bird with an amazing orange plumage under the wings. A warning though if you are driving a car – all I can say is I hope you have good insurance, they have been known to tug and pull on car aerials, and peel off rubber door seals and chew through wiper blades. Due its curiosity and mischievous behaviors, the kea is not as loved as many of the other native birds, in fact, it has in the past been considered a pest/thread of sheep stock which lead to its endangered status. It is probably one of 4 most recognized New Zealand birds (Kiwi, Tui and Fantail being the other 3, in my opinion) and is one of the 87% of New Zealand birds that are endemic to New Zealand. Now, that you have some background, onto the paper pieced block. 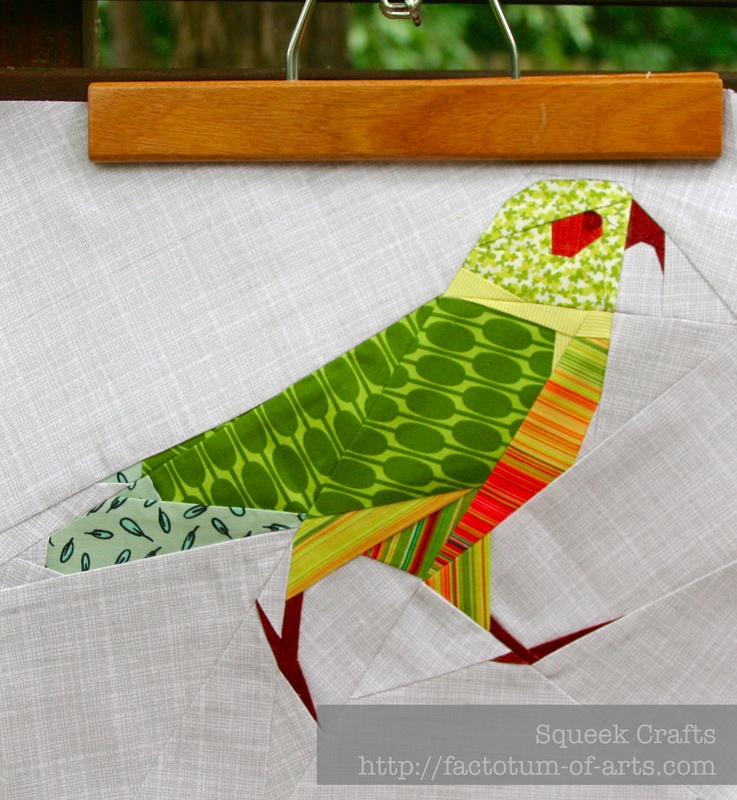 Juliet asked for testers of her new block series on native birds….I jumped at the chance. Her new block was the kea. This block was a lot of fun and definitely has intricate piecing if you are looking to improve your technique it is one to try. I loved how the block turned out. It shows off the prancing of the kea perfectly!! 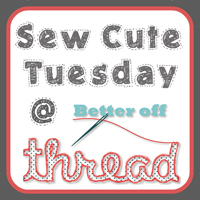 Linking up with Janice for Sew Cute Tuesday @ Better off thread. 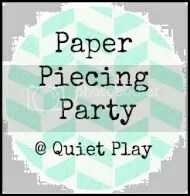 and Kristy @ Quiet Play, Paper Piecing Party. 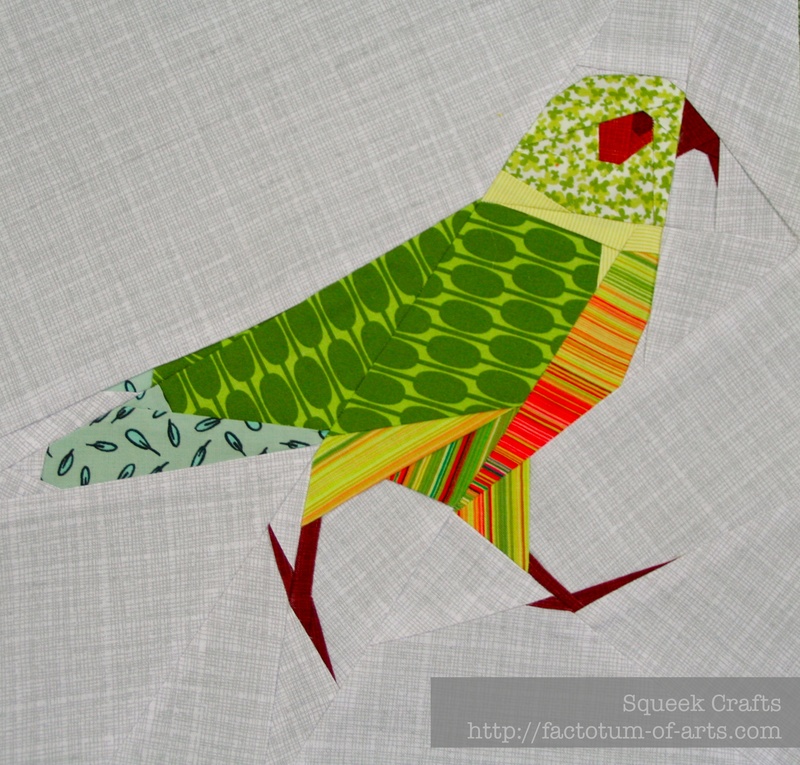 This entry was posted in Uncategorized and tagged block, Kea, Kea paper piecing, New Zealand native birds, paper piecing, patchwork, pillow, quilting, sewing, Tartan Kiwi, tartankiwi on August 5, 2013 by mlwilkie. 🙂 aren’t we always looking for some trouble??? Looks great! Seems like you found the perfect fabrics for it – that striped belly, in particular, is great. Another great New Zealand bird block! LOVE this block! The striped fabric on the breast is just perfect! He is too cute – great fabric choices! It looks just great! Love your fabric choices! It’s so cute 🙂 I also pieced a bird this weekend (the Cardinal, the bird of the state of Virginia, USA). When I saw your block I thought it was a nice coincidence 😉 my pattern is from Liljabs @ Fandom in Stitches… Love your fabric choices!! Your Kea fabric selection really catches the bird s plumage. Thanks for the information on this cheeky bird. LOVE IT! Perfect fabric choices and great execution of this block, Michelle! Hope you don’t mind if I share it, with a link back, on my facebook page at http://facebook.com/sewfreshquilts. Absolutely lovely! I love keas and that block is simply too cute to resist. Thanks 🙂 I am glad you like it.